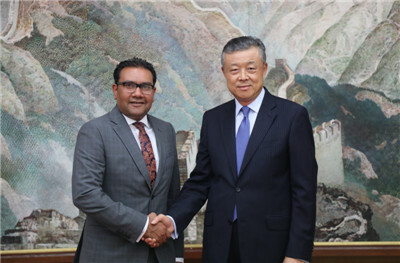 On July 17, Ambassador Liu Xiaoming met at the Chinese Embassy with Faisal Rashid MP, Chairman of All Party Parliamentary Group of the Belt and Road Initiative (BRI) and China Pakistan Economic Corridor, and exchanged views with him on the cooperation of the BRI. Ambassador Liu noted that this year marks the 5th anniversary of the BRI. The past five years have seen the Initiative making remarkable achievements and drawing worldwide attention. The UK has always been a leader in the West on the BRI cooperation. Prime Minister May paid a visit to China early this year, when she expressed the UK government’s clear-cut support for BRI and welcomed the opportunities that the BRI could create for the prosperity and sustainability of Asia and the world. Philip Hammond, the Chancellor of the Exchequer, also emphasized that the UK is a “natural partner” for the BRI. The British government has appointed a Belt and Road envoy and set up a City Expert Board. The Ambassador said that the establishment of All Party Parliamentary Group of the Belt and Road Initiative and China Pakistan Economic Corridor follows the trend of the time and hoped that this would promote the cooperation on the BRI between China and the UK and enhance the in-depth development of China-UK “Golden Era”. 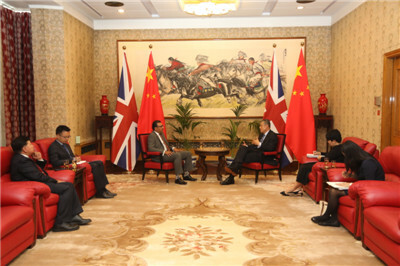 Rashid said that the BRI has provided an important impetus for the development of the countries along the Belt and Road and offered a great opportunity for advancing the UK strategy of “Global Britain”. Therefore he pushed the British parliament to establish the All Party Parliamentary Belt and Road Group. In the future, he is willing to keep close contact with China on BRI cooperation so as to contribute to China-UK “Golden Era”.